Kerala PSC recruitment latest news 2016 include 2 main information. One about Assistant Grade 2 recruitment and other is about Beat forest officer recruitment. 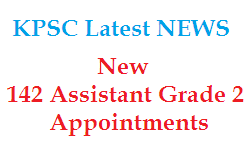 Many candidates are waiting for Company/corporation/Board Assistant grade II appointment from the existing rank list. Public Service Commission blessed some of them with 142 new recruitment for KSFE and KSEB. Majority of them will get the job in KSFE. Now, there are 1731 rank holders were appointed as assistants from this ranked list. The advice memo for these candidates will send immediately from Kollam office. Kerala Public Service Commission received 3, 06, 2017 application for beat forest officer examination 2016 from 4 categories. Among them 3, 06, 132 are for direct recruitment and 75 are for by transfer recruitment. Most number of applicants is in Wayanad- 72,137. Least number is in Kasaragode- 6967.